5/200 Max Braden Magic, science, rivalry - this is a good adventure drama. 19/52 Les Winan Not great, but the superior of the 2006 magician movies. I'll watch anything Christopher Nolan does, even if it's a bit disappointing. 38/68 Michael Bentley Too muddled, too long, and too much effort for too little payoff keeps this from being enjoyable. 64/159 David Mumpower Clunkier and less satisfying than The Illusionist, this tale of revenge involves too many moving parts, most of them unbelievable. Hugh Jackman and Christian Bale play dueling 19th century magicians locked in a deadly battle to learn the secret of each other's trademark illusion in the latest film from Christopher Nolan. Based on the 1996 novel by Christopher Priest, The Prestige is also set to co-star Michael Caine, Scarlett Johansson and David Bowie. 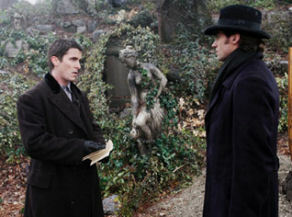 See the latest developments for this project on the The Prestige Movie News page.